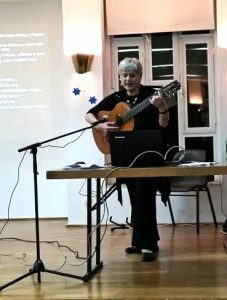 On Wednesday, 8th February, I gave a concert on the subject of “Home”, featuring songs in Yiddish, Ladino and Hebrew that specifically mention places where Jews settled and which they regarded as their home. The concert was divided into two parts: the Old World in Europe, and the New World – just about everywhere else. 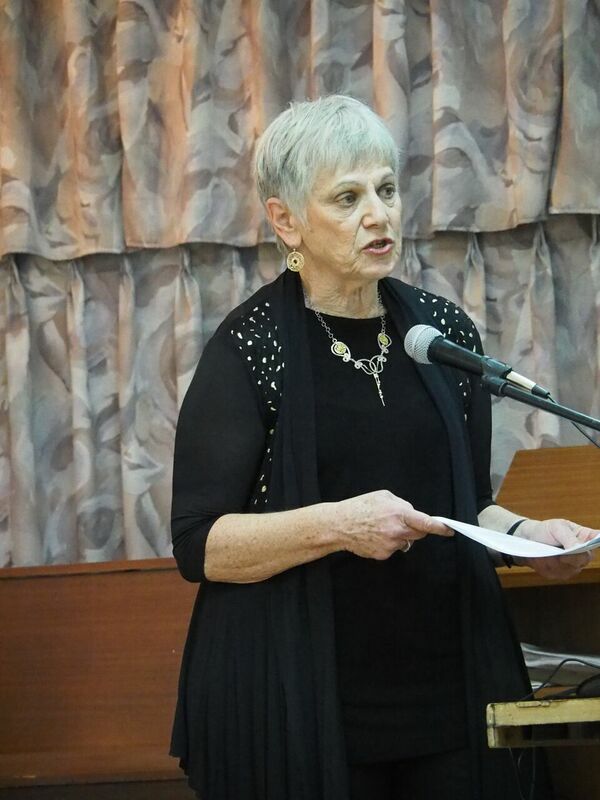 Beginning with the song “Mayn shtetele Belz“, I differentiated between the terms “shtetl” – little town – and “shtetele” – hometown, with nostalgic connotations. Belz, whether the city in Bessarabia, the home of Belzer hasidim in Ukraine, or an imaginary little town in Poland from which a chazan’s son flees to America, is symbolic of all “shtetlekh” – home towns. 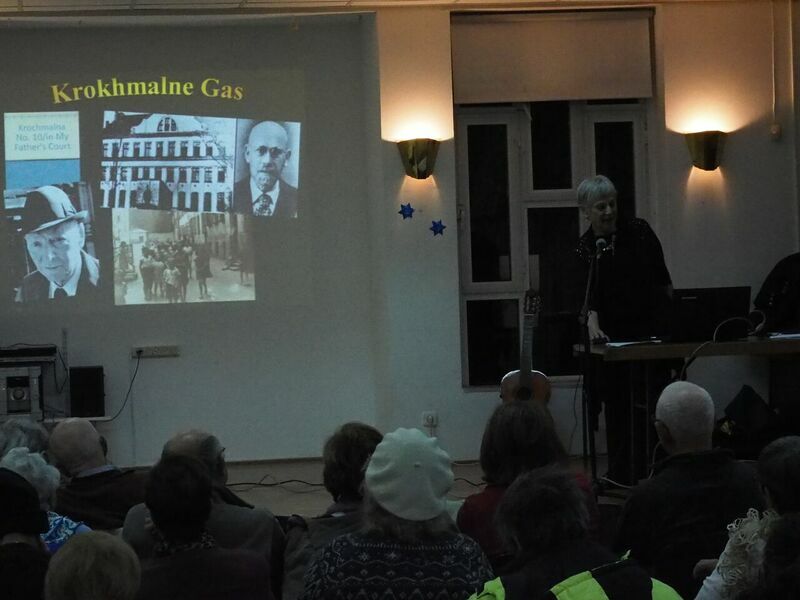 I continued with Yiddish songs about Bialystok, where my parents were born; Vilne – centre of Lithuanian Judaism and Jewry; Krokhmalne Street in Warsaw, home to I. Bashevis Singer and the Yanusz Korczak’s orphanage; “Rumenye” [Roumania] – probably the most famous Yiddish song of nostalgia; and “Dos lid fun Besarabia” – a shepherd’s song of yearning for the past. “Fun kosev biz kitev“, a song about the Baal Shem Tov, represented the towns of Hasidic dynasties. Ladino songs included “La yave d’Espania” [The key from Spain] – Flory Jagoda’s song about the legend of Jews expelled from Spain taking the key from their old houses to their new homes in the Ottoman empire; as well as songs about Saloniki – the only city in Europe to have had a Jewish majority, and where merchants of all religions rested on the Shabbat! The first half of the concert ended with reference to the Holocaust – Gebirtig’s very moving “Gehat hob ikh a heym” [I once had a home], “Khaki li Saloniki” [Wait for me, Saloniki] by Yehuda Poliker, and “Vu ahin zol ikh geyn?” [Where shall I go? ], anthem of refugees displaced by the war. 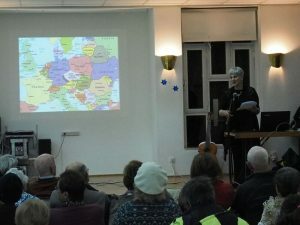 In the second half of the programme, I discussed variations upon the theme of a Jewish homeland. Beginning with R. Yehuda Halevi’s exemplary piyut [liturgical poem] “Yefe nof” [Beautiful view], I continued with its Ladino counterpart “Ir me kero, madre, a Yerushalayim” [Mother, I want to go to Jerusalem]. 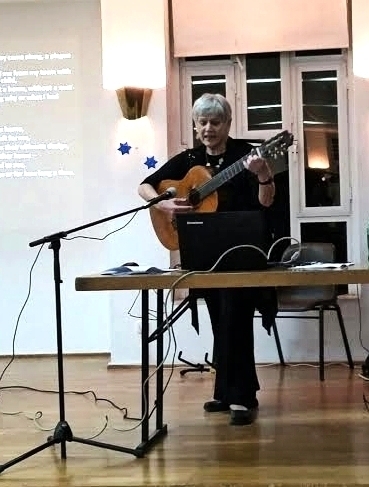 “Shir ha’emek” [song of the valley] was a Hebrew song written about the Zionist enterprise which went “viral”, reaching all corners of the globe. 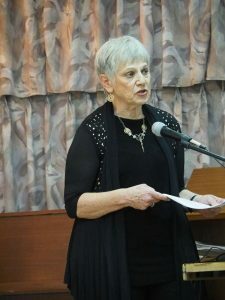 I continued with songs about Mozesville and Buenos Aires in Argentina, Zhankoye in Crimea, Birobidzhan at the end of nowhere(! ), the sweatshops and beaches of New York, Whitechapel in the East End of London, and ended up in “Oystralie” – a send-up of Australia based upon the song “Rumenye“, mentioned above. To round off the evening, we all sang “Somewhere over the Rainbow”, written by two Jewish songwriters for “The Wizard of Oz” but which could conceivably be imagined as a Jewish homeland. To learn more about this fascinating topic, and to listen to some videos, go to the “Home” page on my website: www.jewishfolksongs.com/en/Home.